Ever on the look-out for more material for their horror mill after Dracula and Frankenstein’s runaway success, Universal found an ideal subject in the real-life discovery in 1922 of the tomb of the ancient pharaoh Tutankhamun by Howard Carter and George Herbert. It sparked a world-wide fever of publicity, renewing public interest in Egyptology. The studio also noticed the bewitching effect of the stories detailing a curse allegedly befalling anyone who violates an ancient Egyptian burial site. Ultimately, this scare-mongering only had small scientific merit as a health warning concerning the very real danger caused by releasing aged bacteria - but it didn’t stop the tales that found far-fetched ways of attaching the curse to the fatalities of anyone remotely connected with Tutankhamen’s excavation. Conan-Doyle believed the first ‘victim’, Lord Carnavon, who funded the dig and was present at the opening, died due to elemental forces conjured up by the Pharoah’s royal priests. His venerable reputation did much to fuel the fanciful notions of supernatural vengeance. In fact, only 8 out of the 58 people who witnessed the tomb opening died within twelve years of the event. Even Carter himself remained alive at least until 1939. Nevertheless, such notions are a goldmine to the purveyors of horror entertainment. What became The Mummy actually began as a script by Nina Wilcox-Putnam called Cagliostro about an 18th century historical figure who posed as a centuries-old alchemist and paranormal practitioner. John Balderston, who’d worked on Dracula and Frankenstein, was brought in to do substantial rewrites out of a personal interest stemming from being assigned to the Tutankhamen excavation when he was a journalist for the New York World. He renamed the central character Imhotep after arguably history’s first architect designer of a pyramid - for the Pharoah Djoser. 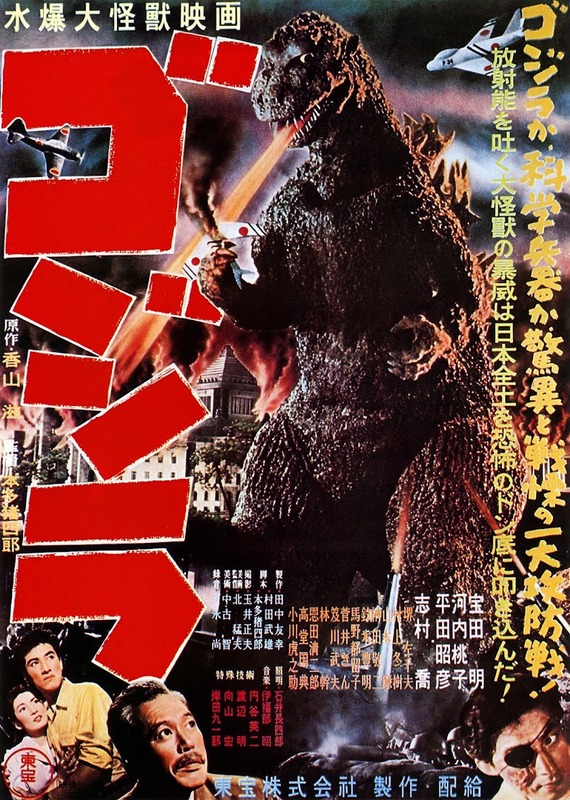 (This name became the working title for the film as well as King of the Dead). Watching The Mummy, one can see elements of his plotting from Dracula, such as the hypnotic central nemesis and his yearning obsession focused alarmingly upon one particular modern-day female. The most direct comparison is obvious - we see Edward Van Sloan as another Doctor (Muller here, Van Helsing before), defending the innocent with threatening oaths once more against attempted supernatural mesmerism by an evil protagonist in a drawing room! Meanwhile, a re-branding of another name was taking shape as Boris Karloff was being positioned by Universal as a new horror star, to be proudly billed as ‘Karloff the Uncanny’. Although it has connotations of an illusionist, the reductive label was one that Karloff felt was an accolade, placing him among the rare pantheon of actors such as Garbo and Barrymore whose last name alone was enough for star recognition. His two decades in the business had suddenly landed him among the screen immortals in just two years of playing horror film roles. No wonder he never regretted his association with the genre. Direction of this new project was given to Karl Freund who’d proved consistently that he was one of the greatest cinematographers in the world - for Fritz Lang on Metropolis, and already in Hollywood on Murders in the Rue Morgue and Dracula. We’ve already discussed how in the latter he often replaced Tod Browning in directing full scenes so it was entirely natural that he moved to fully directing his own films. The casting recruited notable actors linked to the earlier horror hits. Aside from Edward Van Sloan, David Manners from Dracula was recruited as the young hero Frank Whemple. Arthur Byron as Sir Joseph Whemple and his assistant Ralph Norton (Bramwell Fletcher) uncover with Dr Muller the tomb of Imhotep, (Karloff), a mummified courtier buried alive for the sacrifice of trying to resurrect his forbidden love the Princess Ankh-es-en-amon. There is a warning to potential desecrators read out by Whemple: “Eternal punishment for anyone who opens this casket”. He gives a similar verbal one to Ralph not to read from the Scroll of Thoth, but like his employer, the young man disregards it – at a cost. This is the cue for the famous revival of Karloff’s long-dead creature. Impressively swathed in bandages, his is an extremely delicate awakening, portrayed with the subtlest fractional eye-opening and slow minor movement of an arm down his body. 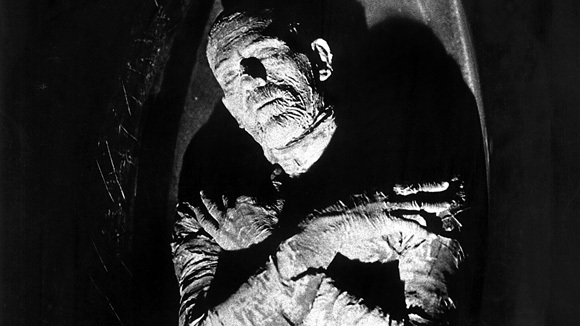 Freund wisely chose to minimise the mummy’s screen exposure by limiting it to just his initial activation, a hand reaching for the Scroll and then a couple of bandages trailing along the floor as he exits (leaving a freaked-out Ralph to cackle: “He-he-he went for a little walk”). The make-up work is another tribute both to Jack Pierce’s artistry and Karloff’s phenomenal patience as this hugely elaborate process for only a few seconds of screen time took eight hours to apply, twice as long as the arduous make-up for the monster of Frankenstein. Pierce drew inspiration from a photo of Pharoah Seti II. Karloff’s face and hands were treated separately to the bodily bandaging, being wrapped in Egyptian (high quality) cotton and collodion and electrically dried. His hair was coated in beauty clay so cracks could be carved into it. Then 150 yards of heat-aged linen were used to wrap his entire body, even though on camera he would ultimately not be filmed below the waist. With detailed make-up applied to the hands and face, and Fuller’s Earth dusted over the corpse as a final touch. He was finally ready except for one small but crucial detail: “You’ve done a wonderful job, but you’ve forgotten give me a fly”, Karloff told Pierce. Such was the complexity and brittleness of the mummification, that Karloff was afraid to breathe out fully in case he broke the carefully-wrapped bandaging. 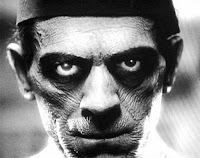 Karloff is marvellous not only in his revivification as the mummy, but in his more extensive dual-role as the modern-day reincarnation, Ardath Bey. Here he radiates a sinister deep self-control, a quiet introspective solemnity of tone and manner. This may partly be a practical solution Karloff found in negotiating this characters’ own make-up. To achieve a visual echo of the mummified Imhotep, Bey’s skin was aged with cotton and collodion solution which as well as still taking four hours to apply, dried to a constricting surface that made speaking dialogue very uncomfortable. Karloff suffered for his art again, yet manfully never complained. He and Pierce had by now become a close and mutually respectful pairing. Wearing a fez and a long straight, spectral white gown to emphasise his tall, slim physique, Bey glides along guiding Frank Whemple and Prof. Pearson (Leonard Mudie) to the tomb of Princess Ankh-es-en-amon. After the treasures are donated to the Cairo Museum, Bey meet Helen Grosvenor (Zita Johann) and is helplessly love-struck as, to him, she is the exact modern-day reincarnation of the Princess. This adds a welcome extra dimension to Karloff’s performance – Bey’s adoration of her is tender and unexpectedly moving, especially when he tells her: “My love has lasted longer than the temples of our gods. No man ever suffered as I did for you”. It’s a line of rare romanticism that almost blends the genre with that of a love story (as in The Terminator when Kyle Reece tells the mother of humanity's future saviour: “I came across time for you, Sarah”). This poetic aspect does not detract from the overtly unnerving presence Karloff exudes at other important points in the film. When required to hypnotise his subjects, the direct penetrating glow of his deep dark eyes is greatly intimidating even on a relatively large TV screen. To cinema audiences it must have been overwhelming and must have served to burn his ‘brand’ upon their nightmares in more ways than one. Johann greatly admired Karloff in their working together. She felt though that within him there was: “A hidden sorrow that I sensed and respected – a deep, deep thing”. True or not, on screen that quality does indeed tinge Bey’s desperate, soulful longing for Grosvenor, a macabre obsession with killing her so that he can mummify her, then resurrect her body as his reincarnated beloved. Johann most definitely perceived misery of a different kind for herself in dealing with her director. Although Freund seemed to generally get along with his creative team, their relationship was an extended nightmare. She came from the New York theatre and took her commitment to performance extremely seriously, what she called the ‘theatre of the spirit’, submerging herself in the role in her dressing room with an almost religious respect. In The Mummy, her ethereal voice and haunted quality beamed through her large eyes is very apt for a character who is believed the incarnation of a venerated Queen of ancient times. (Moreover, Johann’s spiritual connection to the material extended to a real-life belief in reincarnation). She made no secret of her equally passionate disdain for the world of movies however. In Rudy Behlmer’s documentary Mummy Dearest, film historian Gregory Mank recalled her telling him: “I had more respect for the whores on 42nd street than I did for the stars in Hollywood”. Fierce condemnation of the new medium was by no means uncommon amongst stage actors who were still dismissive of the ‘flicks’ as vulgar, lower-class entertainment. This may have fed into a very turbulent and demoralising experience for her in making this film, which she felt was entirely a one-sided victimisation exhibited by Karl Freund upon her. Her phenomenal salary of $7500 a week was hard to resist, yet no compensation for the cruel treatment she endured on-set. Examples included Freund refusing her a chair off-camera, unlike the others actors, for two days of her filming – with the excuse that he didn’t want a single crease in her dress - and allegedly contriving to have her heaviest filming days deliberately coinciding with her menstrual cycle (avoidance of which was an established courtesy). Johann was the kind of individual, headstrong actress that Hollywood is still intimidated by to this day, which can create animosity with those who expect a chauvinistic obedience from women. Her similarity of character and determination to Katharine Hepburn is more than coincidence. Hepburn was considered for Grosvenor before Johann, but opted to work on the east coast. Whether Freund was entirely to blame or not for their professional conflict, meeting Johann in 1979 Mank observed an hauteur in how she received him, grandly preparing her lighting before settling down to be interviewed – even though she was not being filmed. Perhaps her own approach didn’t exactly help endear her to the Hollywood director either. Back to the plot, and in the most famous scene of the film Helen’s gradual slip-back into her ancestral identity is intensified by Bey showing her a vision of her past life in a pool, telling the chilling story of his doomed love for her and the horrific live mummification he is punished with for daring her occult revival. This sequence of terrifying ancient retribution has stayed with me for decades. Maybe I’m not alone in forever associating Egyptian mythology with a kind of claustrophobic horror. Ultimately however, the old world gods come to the rescue, proving Bey’s lugubrious wooing has not outlasted them at all. The statue of the underworld god Anubis raises an arm brandishing the Ankh (ironically a symbol of life) to fatally blast him with a fossilising death-beam, and the dangerous Scroll of Thoth is burned. Sadly, there were some more intriguing flashback scenes filmed that didn’t make the final cut – such as Helen recalling past memories after being shown a large bronze mirror at the museum. That location is also where she relives former lives in 18th century French aristocracy, an 8th century Saxon princess at the time of the Viking invasions and even as a Christian fed to the lions in ancient Rome. In Stephen Jacobs’ Karloff biography, he provides what might be a clue as to why, instead of the usual accepted explanation of running time concerns. Johann may have unwittingly helped cause their deletion as a studio riposte to an unguarded remark she made to Carl Laemmle when he telephoned during an interview that she found unengaging. He was very enthused about the final print of The Mummy, to which she responded: “Do me a favour. I had a lousy rotten time at your studio. Don’t pick up my option for another picture”. She regretted her rudeness later. 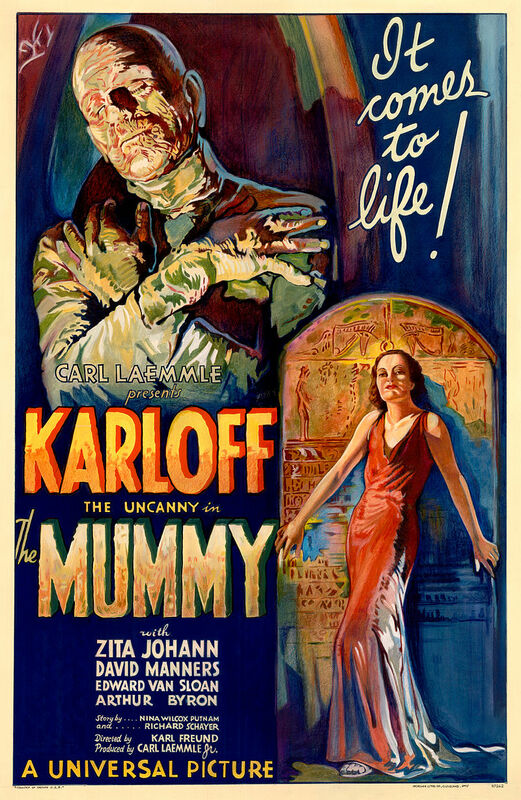 By so refusing to play ball in Universal’s pre-planned ambitions for her (The Invisible Man and possibly The Bride of Frankenstein) she assuredly scuppered her chances of Laemmle’s proposed top billing of her alongside Karloff in the publicity for The Mummy. According to IMDB, after three more films, two for Fox, she retired from cinema for over 50 years, emerging in 1986 as a librarian in another less renowned grave-robber, Raiders of the living Dead. Although it was successful as a lucrative new horror premise for Universal, The Mummy was not reincarnated, so to speak, until almost a decade later in 1940, with western actor Tom Tyler inheriting the bandages but not the name as the mummy Kharis. This stand-alone film spawned three sequels, each increasing in improbability as to how he could be revived after decisively dying at the close of each one. Eventually, the series was wrapped when he suffered that most sinister of all Universal monster fates – a team-up with Abbott and Costello in 1955. Happily, The Mummy has been rejuvenated and refreshed more successfully since, most notably by Hammer in 1959 starring Christopher Lee and Peter Cushing and the Stephen Sommers post-millennial franchise starring Brendan Fraser.